Achieve flawless arches with The Great Brow Basics Kit in Shade 4.5 from brow experts benefit. The kit contains three tools to expertly shape, sculpt and define for salon-worthy results. Housed in a travel-friendly tin. A waterproof eyebrow pencil with built-in spoolie brush. Instantly filling gaps in your brows with a soft and natural finish, the pencil features a custom, non-sharpen 'goof proof' tip and buildable formula that glides effortlessly through the brows, defining, filling and enhancing to help shape and contour your face. Expect beautifully defined brows with a natural finish. Lasts up to twelve hours. A volumising eyebrow gel that works to create natural-looking fullness and definition. With a custom tapered brush and microfibre-enriched formula, the tinted gel deposits tiny fibres that adhere to skin and hairs to give an instantly fuller appearance; its buildable and water-resistant formula provides brows with a natural tint and extra volume. 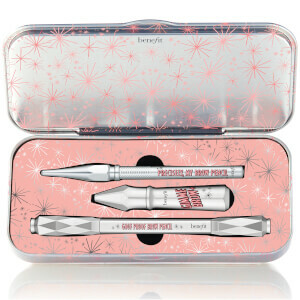 Use the tiny brush for expert application and blending, and the special precision tip for shaping. A waterproof mechanical eyebrow pencil with twist-up tip and built-in spoolie. With an ultra-fine tip and rich, blendable colour, the pencil glides effortlessly through the brows, filling out uneven patches whilst defining their natural shape. No need for sharpening, the precision pencil delivers the perfect amount of colour when applied with a feather-stroke finish and delivers 12-hour wear. Use the integrated spoolie to blend for a professional finish. Goof Proof: Glide eyebrow pencil along brow to fill and shape, using a couple of strokes to build colour. Blend with spoolie brush for soft, natural-looking brows. Gimme Brow: Simply stroke brush tip along brow to define shape. Brush through to blend and build. Precisely, My Brow: Apply brow pencil onto brows using light, short strokes. For extra definition, use longer, horizontal strokes along the base of your brow. Blend with spoolie. Goof Proof: Synthetic Fluorphlogopite, Stearic Acid, Hydrogenated Castor Oil, Synthetic Japan Wax, Ethylhexyl Palmitate, Cera Alba (Beeswax), Sorbitan Sesquiisostearate, Aluminum Hydroxide, Tocopherol. [+/-: Ci 19140 (Yellow 5, Yellow 5 Lake), Ci 42090 (Blue 1 Lake), Ci 77007 (Ultramarines), Ci 77163 (Bismuth Oxychloride), Ci 77288 (Chromium Oxide Greens), Ci 77289 (Chromium Hydroxide Green), Ci 77491, Ci 77492, Ci 77499 (Iron Oxides), Ci 77510 (Ferric Ferrocyanide, Ferric Ammonium Ferrocyanide), Ci 77742 (Manganese Violet), Ci 77891 (Titanium Dioxide)]. N° 09825/A. Gimme Brow: Aqua (Water), Mica, Glyceryl Stearate, Pentylene Glycol, Polypropylene, Magnesium Aluminum Silicate, Peg-100 Stearate, Phenoxyethanol, Polyacrylamide, C13-14 Isoparaffin, Laureth-7, Panthenol, Glycerin, Althaea Officinalis Root Extract, Silica, Citric Acid, Potassium Sorbate, Sodium Benzoate. [+/-: Ci 19140 (Yellow 5, Yellow 5 Lake), Ci 42090 (Blue 1 Lake), Ci 77007 (Ultramarines), Ci 77163 (Bismuth Oxychloride), Ci 77288 (Chromium Oxide Greens), Ci 77289 (Chromium Hydroxide Green), Ci 77491, Ci 77492, Ci 77499 (Iron Oxides), Ci 77510 (Ferric Ferrocyanide, Ferric Ammonium Ferrocyanide), Ci 77742 (Manganese Violet), Ci 77891 (Titanium Dioxide)]. Precisely, My Brow: Stearic Acid, Talc, Rhus Succedanea Fruit Wax, Hydrogenated Castor Oil, Cera Alba (Beeswax), Cera Microcristallina (Microcrystalline Wax), Paraffinum Liquidum (Mineral Oil), Hydrogenated Coconut Oil, Hydrogenated Palm Kernel Oil, Aluminum Hydroxide, Hydrogenated Palm Oil, Tocopherol, Lecithin, Bht. [+/-: Ci 19140 (Yellow 5, Yellow 5 Lake), Ci 42090 (Blue 1 Lake), Ci 77007 (Ultramarines), Ci 77163 (Bismuth Oxychloride), Ci 77288 (Chromium Oxide Greens), Ci 77289 (Chromium Hydroxide Green), Ci 77491, Ci 77492, Ci 77499 (Iron Oxides), Ci 77510 (Ferric Ferrocyanide, Ferric Ammonium Ferrocyanide), Ci 77742 (Manganese Violet), Ci 77891 (Titanium Dioxide)]. N 09838/A. Please Note: All ingredients may vary by shade.